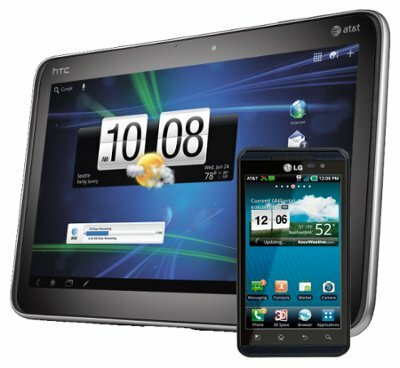 HTC Jetstream 10-inch Honeycomb tablet and LG Thrill 4G Android smartphone goes on sale at AT&T. The HTC Jetstream and LG Thrill 4G are finally available on AT&T. The Jetstream – which gets a retail price of $699 with a two-year contract – is not only the carrier’s first LTE-based 4G tablet, but it is also its first 10-inch tablet computer. It features an Android 3.2 system with HTC’s first version of Sense interface for Google OS. Another thing that the HTC Jetstream is heavily promoting is its built-in dual-core Snapdragon. It is powered by a 1.5GHz MSM8260, instead of the previous NVIDIA Tegra 2 that Google uses for its earlier models. The tablet also offers a 12-hour battery life and a minimum of 32GB internal storage. The LG Thrill 4G, on the other hand, is an Americanized version of the Optimus 3D device. It has a full support for AT&T’s HSPA+ 3G bands, and adds Gameloft 3D games and mSpot 3D movies to its powerful Android 2.2 system. The Thrill is jam-packed with cool features, including a dual 5.0-megapixel cameras that could record 3D videos, and a 4.3-inch, 480×800 screen display that could support glasses-free 3D. Furthermore, the handset also gets a dual-core, 1GHz TI OMAP chip and dual-channel memory, making it one of the fastest smartphones to date. The Thrill 4G could be yours for only $100 on contract. AT&T, Releasing Samsung Galaxy Tab on November 21?